4 "NO WAR, NO WAY"
12 "Where Do We Go From Here?" Rev. Graylan Scott-Hagler..s a Washington DC pastor and activist. Speakers included Larry Adams - Labor Against the War, Pam Africa Activist International Concerned Family and Friends of Mumia Abu-Jamal, Sami al-Arian Professor University of South Florida (Tampa, FL)->Computer Science, Tariq Ali Author, Luis Alvarez Committee for the Rescue and Development of Vieques, Nihad Awad Co-Founder and Exec. Dir. Council on American-Islamic Relations, Brian Becker, Co-Director International Action Center, Vernon Bellecourt Director (Former) American Indian Movement, Mahdi Bray Director Muslim Public Affairs Council->Communications, Helen Caldicott M.D. Founder Physicians for Social Responsibility, Illel Cohen Activist, , Tarek Elgawhay Spokesperson Muslim Student Association Shaker Elsayed, Secretary-General Muslim American Society, Sara Flounders Spokesperson Iraq Sanctions Challenge, Jane Franklin Author, Teresa Gutierrez Co-Director International Action Center, Graylan Hagler Minister Plymouth Congregational Church of Christ (Washington, DC), Cheri Honkala, Founder and Executive Director Kensington Welfare Rights Union, Rafik Jaber President National Islamic Association for Palestine, Teresita Jacinto Member Committee for Indigenous Solidarity, Randa Jamal Member Palestine Right to Return Coalition, Amer Jubran Activist, Sala Kahn, Activist Magdy Mahmoud, President , Metropolitan Muslim Federation->New York, New Jersey, Carl Messner Co-Founder, Partnership for Civil Justice, Riya Ortiz, Representative Asha Samad-MatiasSpokesperson Muslims Against Racism, Grace Trevett Activist. Representatives and supporters of the ANSWER (Act Now to Stop War & End Racism) coalition held a news conference at the National Press Club in Washington, D.C., June 18 2002, to announce the National Campaign to Defend Civil Rights. The group announced a major demonstration on June 29 at the headquarters of the FBI and Justice Department. "Our community is uniting with other civil rights and anti-war organizations to mobilize for the June 29 demonstration protesting the attacks on civil rights and civil liberties," stated Mahdi Bray, executive director of the Muslim American Society's Freedom Foundation. Rainbow Coalition/PUSH leader Joe Leonard explained that his organization was mobilizing for the June 29 protest because President George W. Bush and Attorney General John Ashcroft's use of racial and political profiling was "a threat to all the hard won civil rights gains of past generations." "The Bush administration is substantially expanding the FBI and CIA authority to conduct domestic spying in the absence of probable cause or criminal conduct and is authorizing indefinite detention for citizens and non-citizens at the sole discretion and the direction of George Bush and John Ashcroft--without charge or trial, and without access to an attorney," Mara Verheyden-Hilliard of the Partnership for Civil Justice explained in analyzing the government's latest move. Other speakers at the news conference included: Lubaba Abdallah, Muslim Student Association of U.S. & Canada; the Rev. Graylan Hagler, senior minister, Plymouth Congregational Church; Macrina Cardenas, Mexico Solidarity Network; Peta Lindsay & Daniel Keesler, ANSWER youth and student organizers; Chuck Kaufman, national coordinator, Nicaragua Network; Damu Smith, Black Voices for Peace; and Brian Becker, co-director, International Action Center. Activists inside the United States and internationally paid tribute to the struggle-oriented legacy of Dr. Martin Luther King, Jr. with marches, civil disobedience, rallies and much more. A majority of these actions took place on Jan. 19, 2004 the U.S. federal holiday recognizing his birthday. In Washington, D.C., despite physical intimidation by security personnel and police, a solidarity action with the striking Sterling Laundry workers prevailed. 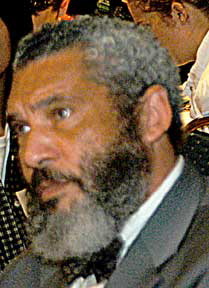 Prominent Black activists Mahdi Bray, a leader of the Muslim American Society, the Rev. Graylan Hagler, Latina members of the UNITE union, and representatives of the Baltimore All-Peoples Congress were present, and repelled these physical attacks by goons. Endorsers for the Congress included Rev. Graylan Hagler National President- Ministers for Racial, Social and Economic Justice. In 2009 Graylan Hagler was listed as an endorser of the Center for Labor Renewal. More than 100 activists and journalists from a variety of organizations, religious groups and media outlets attended a gathering with Iranian President Mahmoud Ahmadinejad at the Warwick Hotel here Sept. 21, 2010. The leader of the Islamic Republic of Iran was in the city to attend the annual United Nations General Assembly. Metro-DC Democratic Socialists of America endorsed and campaigned for two candidates for Washington DC Council running explicitly left-progressive platforms: Eugene Puryear of the Statehood Green Party and Graylan Hagler, running as an independent. Despite vigorous campaigns by both, Puryear finished sixth with 3.5 percent of the vote, and Hagler seventh with 3.0. Winning the second seat, formerly held by Catania, was Elissa Silverman, formerly a reporter for the Washington Post and Washington City Paper, with 12 percent. Insights into the way money and power manage electoral politics in Washington, D.C., came to the Democratic Socialists of America run Socialist Salon in November 2014 via Rev. Graylan Hagler, senior pastor of Plymouth United Church of Christ, an at-large City Council candidate in the recent plebiscite. Hagler, an Independent candidate who came in behind several other Independents in a race won by Democrat Anita Bonds and Independent Elissa Silverman, pointed out that of around 100,000 votes cast in the crowded at-large Council race, “60,000 were undervotes.” Those voters, who could vote for two candidates because two seats were available, cast a vote for only one of the candidates. The Democratic establishment, he said, had called for a “bullet vote” to ensure that Bonds, an undistinguished legislator who had been appointed to a seat made vacant by a prosecution for corruption, would win an electoral victory. This page was last modified on 24 January 2018, at 04:46.